Katie Corgiat got hooked on fishing early. 1.Please tell us a little about yourself and how you got into fishing? My fishing story began on the end of a relative’s dock, at the young age of three. My mom and dad helped me reel in my first fish, a northern pike, and you can say that I was instantly hooked. Fishing is a little more than just a hobby for me…it’s my passion. 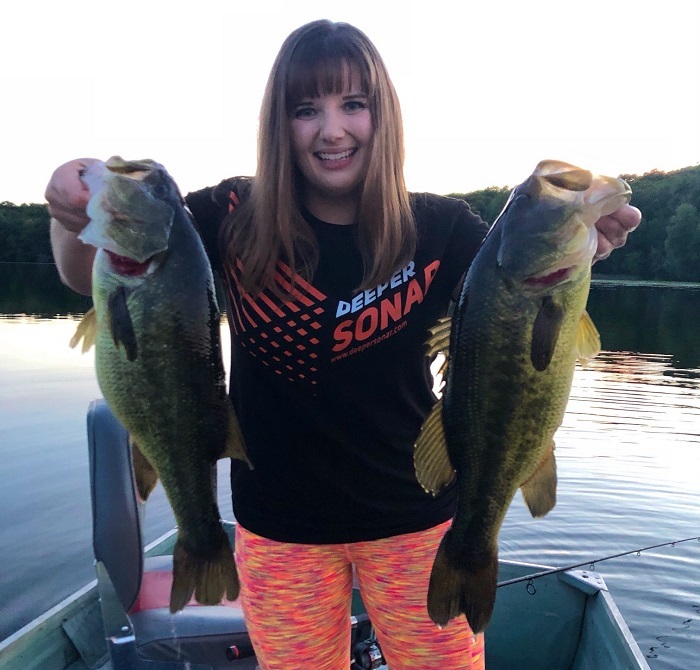 I love sharing the simple joys of fishing with others and being an educator and ambassador for the sport, while striving to be a better fisherwoman every day. Throughout the years, so many people in the fishing community have selflessly invested in me, helping me refine my technique and grow into an avid freshwater and saltwater angler. 2. Why do you fish? Besides the obvious, do you find it relaxing, challenging…maybe it’s an adrenaline rush? A lot of my hours outside of work are spent out on the water fishing. Many fishermen choose to focus on one species to consistently pursue; however, I consider myself to be an all-species angler. There’s nothing more exciting to me than trying a new body of water, be it a lake, river, or ocean, and aiming to check a new fish species off of the extensive bucket list. Fishing is also such a fun way to just relax, refresh your mind, and enjoy the outdoors, while befriending new anglers. Growing up in Minnesota, I’ve been blessed to have many bodies of water at my fingertips. 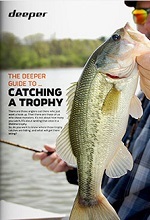 To know that you can travel to a little metro area lake and land a trophy fish is a thrill. There are times when I’m on the dock, or at the boat ramp, and I’m the only female. I’ve sometimes noticed looks from men, wondering what I’m doing out there. When I throw out a lure, or net my own fish, the tide turns. All of a sudden, the acceptance is there. I aim to prove that fishing transcends gender. 3. Angling is slowly on the decline in many parts of the world. How do you inspire others to take up the sport? In my opinion, so many people never give fishing a chance because they don’t know where to start. Simple education about the sport of fishing can go a long way…especially with today’s youth! I enjoy volunteering with local organizations to get children out on the water. Seeing the looks of wonder and delight on the faces of little ones as we take them out fishing for the first time, and they catch their first few fish, makes me feel so proud to be a fishing ambassador. 4. Do you have an epic fishing story you’d like to share? 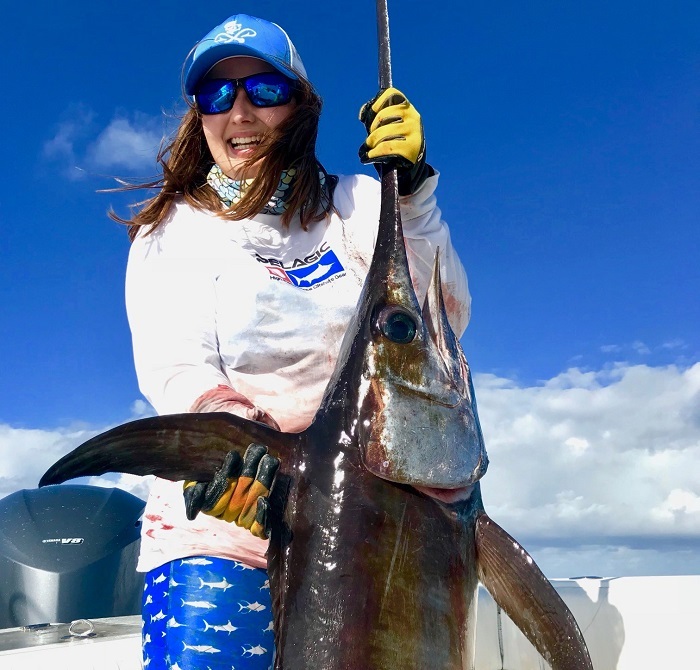 You know those days out on the water that are SO unbelievably incredible that you ask yourself, “Is this a dream?” I experienced the adventure of a lifetime while saltwater fishing down in Marco Island, Florida at the very end of June 2018. The goal was to catch a few different shark species (and of course have some major fun while doing so). Captain John, my friend Becky, and I did just that, fighting multiple blacktip shark, blacknose shark, and hammerhead shark throughout the day. Becky and I even had a double-shark-hook-up, which caused us to do some crazy dancing around each other to keep the lines untangled! 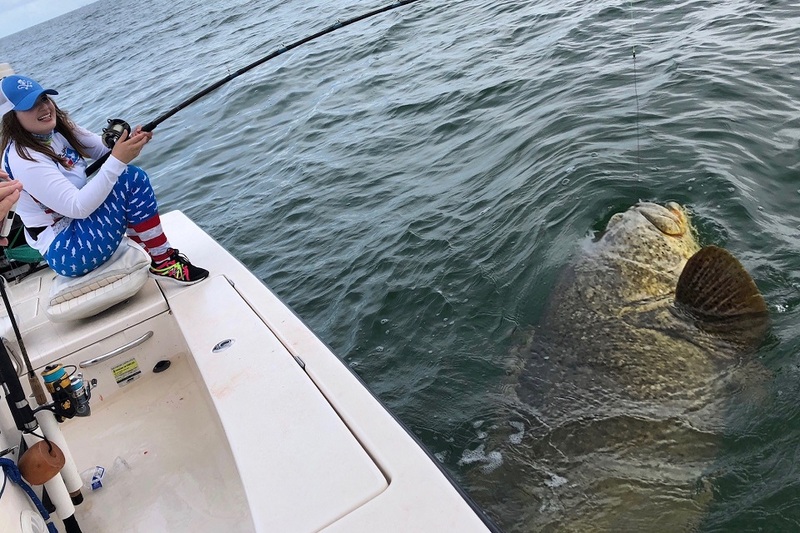 While Becky brought in her very first shark ever (a 4’ blacktip) next to the boat, and I was hooked up with a 6’ hammerhead, a MONSTER ~500 POUND GOLIATH GROUPER ATE BECKY’S SHARK!!!! We caught the experience on video, and thankfully the grouper eventually decided to spit the shark out. Captain John said that was the largest goliath grouper he had ever seen on the water, and I said I wanted to catch it. I think he thought that I was kidding...I wasn’t. After landing the 6’ hammerhead, we went back to the goliath grouper’s home and rigged up the rod. I was supposed to give the gear a quick test but before I could, WHAM!!!! I had a MONSTER on! This is the largest fish I have ever caught in my entire life, and was the most intense fight I’ve ever experienced...500 pounds of pure muscle vs little 5’3” Katie. About 30 minutes of insanity later, the giant was up next to the boat, and was safely released to be someone else’s legendary fish story. 5. On an ending note, maybe some words of advice for beginners? When I was little, I used to sit in front of the TV on Saturday mornings, watching fishing shows (instead of cartoons), and daydream about one day having the opportunity to be an advocate for the sport of fishing. Throughout the years, my friends, family, and many anglers in the fishing community have encouraged me to follow my passion and share the simple joys of fishing with others. I hope to inspire people of any age, gender, or background to get out on the water. If you never try, you’ll never know…and I’m still learning, too.